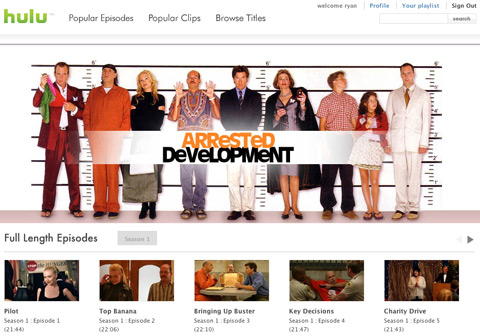 Could Hulu, the mega-popular VoD service be coming to an Xbox near you? Maybe, if you live in the US. After Microsoft and BSkyB announced they would be teaming up to offer Sky content on Xbox 360s in the UK, murmurs that a similar service might appear stateside with NewsCorp’s US based VoD being offered on US Xboxs, although nothing official has been announced. However if you live on the right side of the Atlantic is may be some time yet before you see Hulu on your Microsoft console, although plans to bring Hulu and its wealth of American content to British viewers are afoot. The proposed service in the UK would pick up the baton from the VoD none-starter that was Kangaroo. Sky opposed the service which would have seen the BBC, ITV and Channel 4 offering content on one online platform. But with Hulu the potential for a single consolidated UK VoD service looks oddly probable, while also offering about 125 days of US content. With September being muted as a possible launch date for Hulu in the UK, look for a Xbox service at the start of 2010.